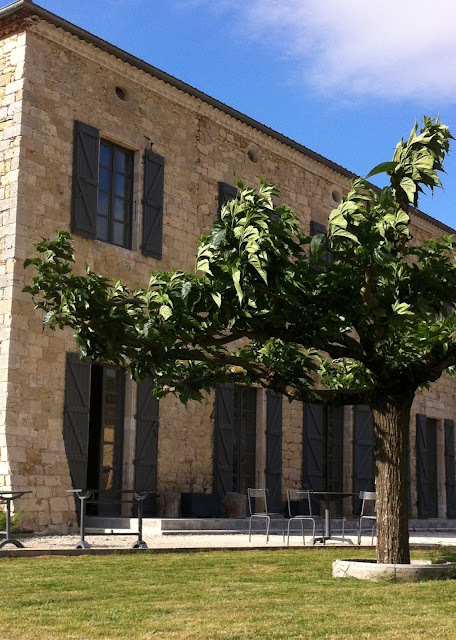 A week or two ago we were invited to spend a few days with very old friends at Chateau Engalin near the Gers village of Mauvezin in south-west France. 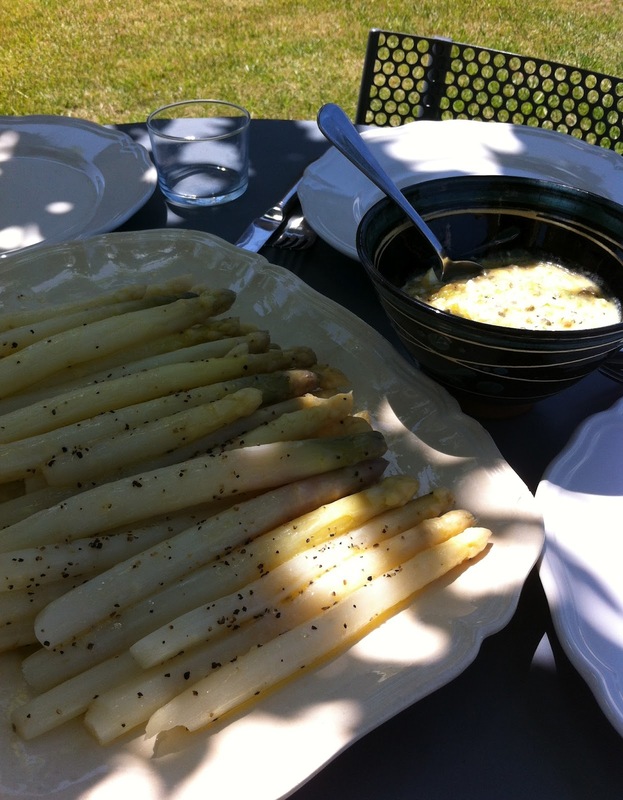 Our stay there coincided directly with the height of the asparagus season which in Gascony very definately means white asparagus. We love it but wonder what is it about white asparagus that makes it so unpopular and little eaten on these islands? Is it because it is difficult to grow requiring constant nurturing in the dark, where a moment's sunlight could ruin a whole crop or perhaps it's the association with the nasty, tasteless and overcooked industrial product in tins or jars which used to pass as white asparagus. If fresh and cooked correctly and with the right simple accoutrements it is delicious. It has an undoubtedly more subtle taste than it's greener cousin. It's ghost like appearance being reflected in the etherial quality of it's flavour. But we think it is high time to put old prejudices aside and embrace it's delicious earthy and distinctive taste. We cooked two huge bundles picked up at the market which was enough to make an enourmous platter with "festive" baguettes and a grabiche to accompany it. The dish was devoured at our daily alfresco lunch ritual under the mulberry tree on the south side of the chateau. Grabiche is a sort of cross between a mayonnaise and a tartar sauce. It has similar ingredients to tartar sauce but unlike mayonnaise is made with hard or semi-hard boiled eggs rather than raw ones. We think white asparagus in butter, salt and crushed black pepper is delightful but for that extra wow factor serve the pale spears with a generous dollop of grabiche. Remember the asparagus spears should be gently peeled to remove the tough outer skin and about one quarter of the base end removed. Drop them into boiling salted water and cook until softened but still "al dente". They take longer than green spears but you should keep a close eye on them nevertheless. Drain and dress with butter and seasoning much as you would with say corn on the cob. Serve with the grabiche and bread on the side. Ghostly fingers in dappled sunlight! Place all the ingredients except the eggs in a large bowl and combine well. Place the boiled eggs whole in the mix and crush with a fork. Gently mix in the eggs making sure not to break them up too much. You are looking for a chunky texture. Taste and adjust as necessary. The sauce should pleasantly blend it's constituent sweet, acidic, salty and bitter elements.